Allu Arjun is a popular Telugu actor and son of popular Telugu actor and producer Allu Aravind. Allu Aravind has gifted a swimming pool to his grandson Ayaan, son of Allu Arjun. Allu Arjun has been married to Sneha Reddy for 8 years now and they have two children, Allu Ayaan and Allu Arha. Their son, Ayaan is celebrating his birthday today and like every grandparent, Allu Aravind has gone to his extent to make his grandson happy on his birthday. He had asked his grandson Ayaan about what he wanted for a birthday 45 days ago and on his birthday, to everyone’s surprise, gifted him a swimming pool and delivered it on dot. The family has named it the ‘Allu Pool’. 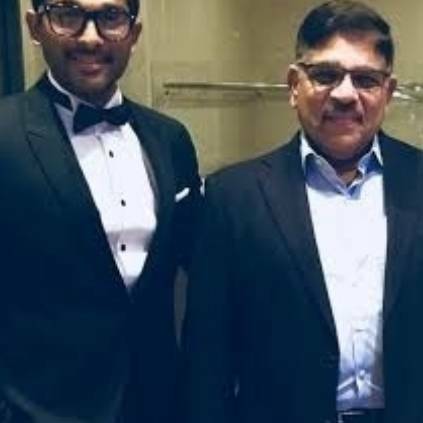 This grand gesture of love by Allu Aravind towards Allu Arjun’s son has taken the internet by storm. Allu Arjun has even posted about it and stated he envies his children for being the lucky 4th generation kids. People looking for online information on Allu Aravind, Allu Arjun will find this news story useful.